Simba meets up with the green fingered team behind the beautiful In Harmony with Nature exhibition that won SA a silver medal at London's Chelsea Flower Show. Created, styled and conceived by David Davison, In Harmony with Nature, combines landscapes depicting our forest, grassland and fynbos. This week, join Simba as he gets his hands dirty planting herbs with Horticulturalist J.J van Rensburg, learns about making a small garden work for you and how to make a completely organic edible garden in an urban setting with the help of Jane Griffiths (writer of Jane's Delicious Garden). He also finds out how easy it is to recreate landscape designer Sonita Young’s low maintenance, prairie-style drifts of perennials and grasses. The In Harmony with Nature display also includes a floral portrait of former president Nelson Mandela, created using everlasting protea flowerhead rosettes. 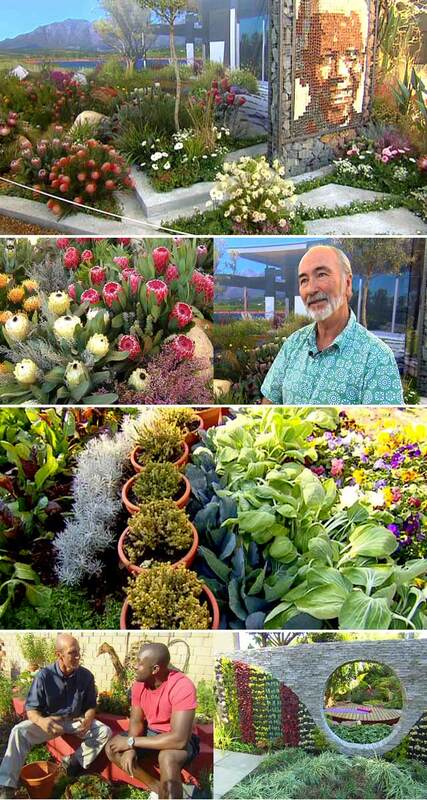 Join Top Billing in Muldersdrift for the Garden World Spring Festival on SABC3 this Thursday at 20:30. The Garden World Estate is situated in the tranquil rural surrounds of Muldersdrift, north west of Johannesburg in Gauteng.